Fig. 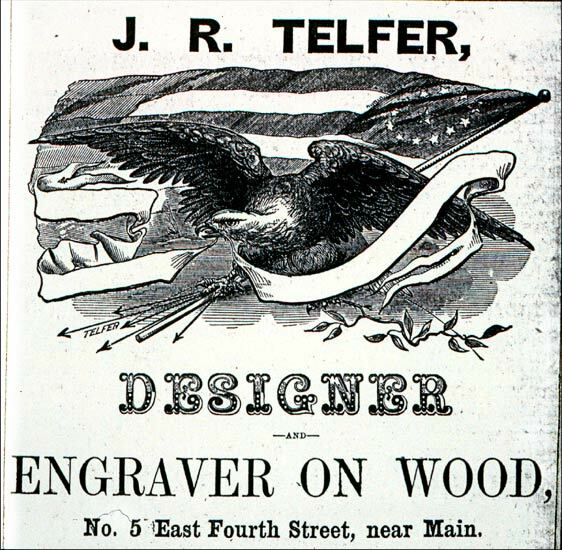 2.38 J. R. Telfer, / Designer / and / Engraver on Wood, / No. 5 E. Fourth Street, near Main. John Telfer. Woodcut. 2&10/16 x 4&12/16 in (6.67 x 12.07 cm). Williams' Cincinnati Directory... 1857 (Cincinnati: published by C. S. Williams, [ca. 1856]), p. 292. The Public Library of Cincinnati and Hamilton County.